There's still a set of Hogan Golf Apex irons in my basement. They're 15 years old and, with new grips, I'd gladly play them tomorrow. Imagine my excitement, then, when I learned Callaway Golf had sold off the Ben Hogan name to Terry Koehler and that new company would be coming out with irons in 2015. Needless to say, when I saw the Ben Hogan logo on Demo Day at the PGA Merchandise Show last week, I had to stop. Right away, I saw something I didn't expect: no iron numbers. Instead, each club had a loft on it. The Ft. Worth 15 irons and TK 15 wedges are forged from premium 1025 Carbon Steel, and their heads come in 44 different lofts from 20-63 degrees. A player can make a set with the gaps that fit their game. With the proliferation of hybrids and the fluid definition of the ideal (read: deceptively stronger) loft for each iron, it all makes sense, even if it takes a little mental adjustment. “In today’s marketplace, 6-iron lofts can range from 26 to 35 degrees, so how could a golfer ever make a fair and accurate comparison?" Koehler said. The full line of clubs is perimeter weighted, albeit in a unique way, with what amounts to a designed thumbprint moving weight to the edges of the hitting zone for maximum forgiveness. The weight doesn't go all the way to the club's edge, but that's because you wouldn't be playing these irons if you ever hit the ball there. The heads are also progressively weighted so the player can get the right amount of loft and spin for each club head. Each club features the V-shaped sole, which has a stronger bounce on the leading edge to go along with lower bounce on the complementary edge. The design not only offers versatility but forgiveness. All clubs will cost $150 per club for the standard KBS Tour V or KBS Tour 90 shaft. The UST Mamiya Recoil shaft is the standard graphite offering, coming in at $165 per club. A variety of custom shaft and grip options will be available. The company will offer an online fitting experience, with golfers asked to fill out a basic questionaire so the company can recommend a full set of irons and wedges that match their ability and power. 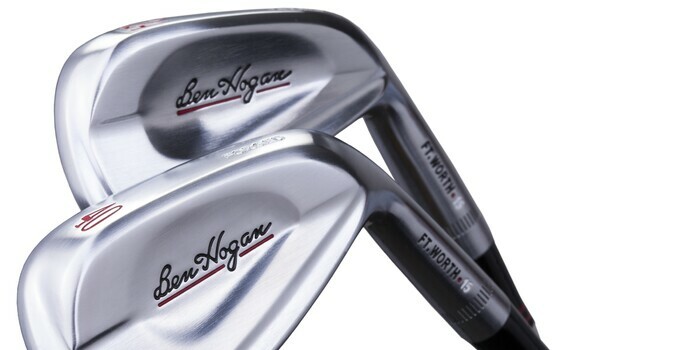 The new Ben Hogan Ft. Worth irons and TK 15 wedges ship in April.